Lake Worth FL has a rich history of horseshoe pitching. 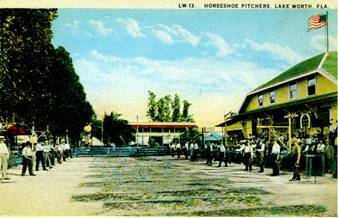 In February 1925, Lake Worth hosted the horseshoe World Tournament. Putt Mossman of Eldora, Iowa won that tournament and $400. Since then, with the beautiful Intracoastal Waterway in the background, we are still pitching. 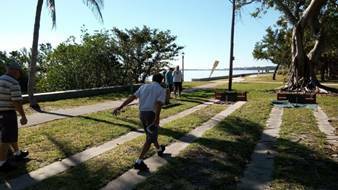 Come over to Bryant park, at the foot of the Lake Worth Bridge, on Tuesday, Thursday, or Saturday from January thru March, between 9am and 11am and say hello. Directions to Bryant Park: Take 6th Ave South exit off of I-95, Follow east to Federal Highway, left on Federal Highway, Turn right on 2nd Ave South and follow to the end. 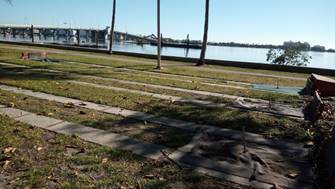 The horseshoe pits are along the Intracoastal. Contact Ed Stevenson at 413-442-5968 or email ejstevenson@verizon.net.